Fitness For Africa is one of It’s Time Fitness Community Initiatives. It’s our own way of giving back and a project to spread the message for health, fitness and wellness in Africa. As we know from 1 Corinthians 3:16, as believers we are God’s temple, and God’s Spirit dwells in us. It is important to emphasize living healthy and fit in the African community . They often neglect their physical health and well-being by not exercising and making poor food choices. By introducing fun ways of staying active and promoting health awareness, we can prevent or combat poor health conditions and chronic diseases, improve mental health and mood and increase chances of living longer in Africa. Fitness also helps to build confidence and self esteem in adults and growing kids. Our goals include educating them about the benefits of fitness and providing practical ways to incorporate fitness and wellness into their everyday lives. We believe fitness and wellness not only applies to the Body but the Spirit and Soul as well. Music and dancing are very prominent parts of the African culture. We believe that dance fitness and other form of aerobics exercise will be an effective way to encourage fitness in the African nations. That’s why we are working to create a fitness DVD with African rhythms . To accomplish our goals, we will be partnering with churches and organizations doing missionary work and health related projects in Africa. This will involve traveling to Africa to organize live workout sessions and seminars or feature in an event already taking place. Our fitness DVD will also be an important resource to encourage fitness as it can be distributed in places we do not have access to. Our Fitness For Africa Project in Nigeria summer of 2015 was a success with great attendance and participation at the 5 events we had in Lagos and Ogun State i.e. 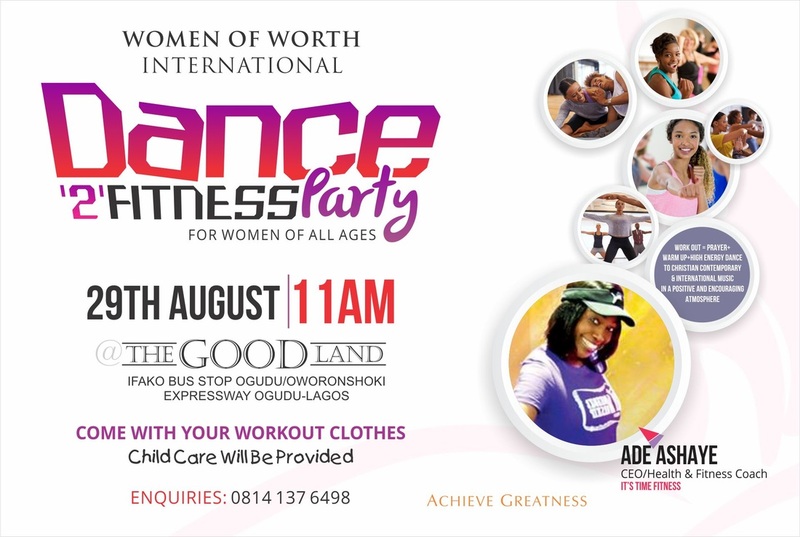 Women's Conference organized by Women Connected By Purpose, Dance to Fitness Parties at Global Impact Church, RCCG Discovery Center and RCCG Amazing Grace Parish. and Chapel of Victory, Sagamu, Ogun - State. 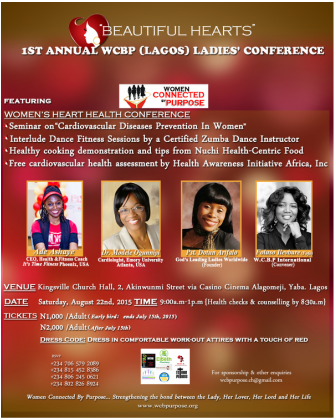 Ade also had the opportunity to share about health and fitness on Lagos Television, Channels TV and Eko FM. You can view pictures on our website at www.itstimefitnessaz.com/gallery. 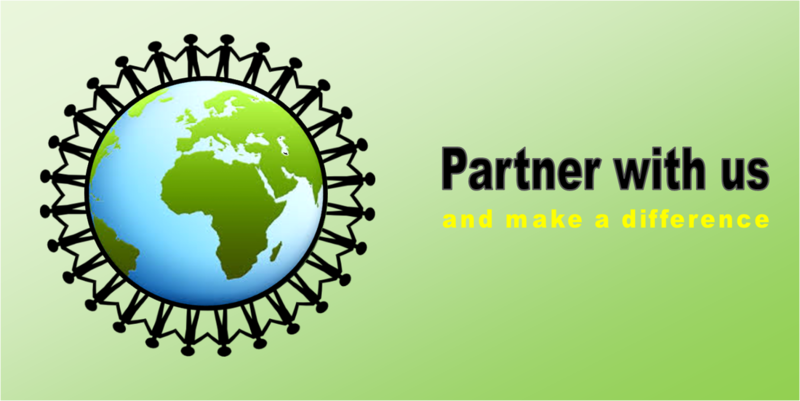 If you are a church or organization and would like partner with us or sponsor our Fitness For African events, please click on "Partner with us" below to contact us. We appreciate your support. Check addressed to Ade Ashaye, note for Fitness For Africa. Proceeds from our T- shirt sales goes to support our Fitness for Africa Project. Our irresistible T-shirts are designed to fit and look stylish on you. They also make great gifts for the holiday season. It's just another way of showing that you care and inspire. It is our desire to see people from different nations in Africa embrace fitness and healthy living as a lifestyle, build self-esteem and a healthy self-image so they can fulfill their God-given purpose and live a long life. We hope you will support this cause that is dear to our hearts. We all can enjoy the benefits of good health and fitness i.e. long life, absence of sickness and diseases, happiness, more energy, weight control and the list goes on. Copyright © - It's Time Fitness. All Rights Reserved.